Edited by: Gudrun Miehe, Katrin Bromber, Said M.A. Khamis, Ralf Großerhode. Series edited by: Gudrun Miehe, Hilke Meyer-Bahlburg. 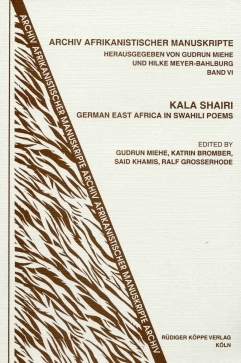 The present volume contains a collection of historical Swahili poems created at the time of German colonial rule in Tanzania (1884–1914) which express the contemporary situation of the inhabitants. Using epic poems and praise songs the German conquest and African resistance is described in detail. The presented poems are highly differentiated regarding form, style and language and therefore provide an excellent survey of the different poetic forms/modes of expression of the time. The texts were primarily drawn from the numerous poem collections of the German Swahili researcher Carl Velten (1862–1935). The reader is provided with an extensive historical introduction, detailing the resistance of East Africans to German occupation of the coastal region (1888–1890), followed by a description of the Hehe wars, the war against Hassan bin Omari, the bombardment of Zanzibar and the Maji-Maji insurrection (1904–1905). The historiographical account is significantly enhanced by the Swahili poems that can be regarded as as a distinguishing feature of the period. The introduction provides further analysis of the style and linguistic features of the poems, apart from biographical data on the poets and the original editors. Because of the historical context of the poems and their linguistic complexity, the anthology will be of interest to historians and general linguists as well as to Bantuists.